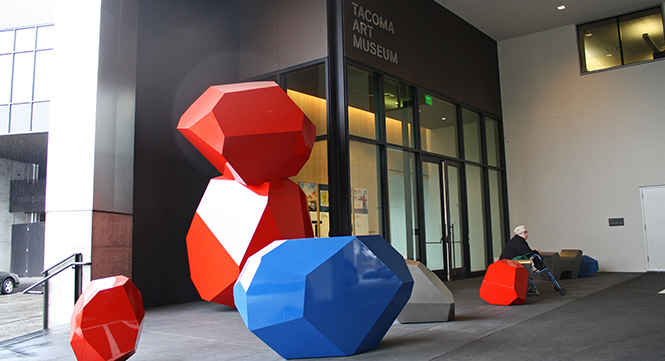 Adding to the excitement of November 2014, Tacoma Art Museum unveiled two new outdoor sculptures: Julie Speidel’s Kinetic Repose, and Marie Watt’s Blanket Stories: Transportation Object, Generous Ones, Trek. 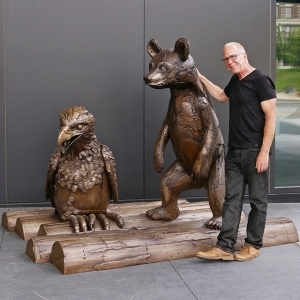 A third outdoor sculpture, Scott Fife’s Explorers, was installed in June 2015. All three sculptors are well-known to the community through previous exhibitions and works in the museum’s permanent collection. These commissions activate the spaces around TAM, inspire visitors and the community, and begin TAM’s ambitious new outdoor sculpture program. 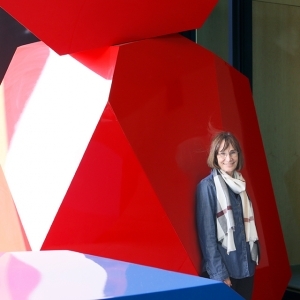 Julie Spiedel at the installation of Kinetic Repose standing beside “Big Red”. Julie Speidel’s Kinetic Repose is an artistic interpretation of our region’s remarkable geological history, representing erratic boulders left behind by the glaciers that carved out Puget Sound during the last ice age. 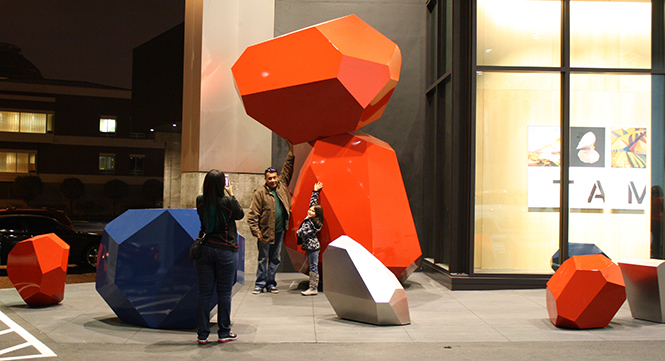 Kinetic Repose is comprised of ten painted stainless steel pieces, including three benches for seating; the tallest piece, affectionately nicknamed Big Red, stands around 14 feet and has already become a well-appreciated “photo opp” for visitors. Speidel’s colorful installation enlivens the new parking level foyer and introduces TAM’s art collection upon arrival. 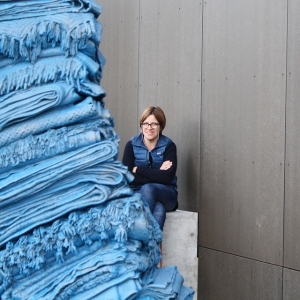 Marie Watt at the installation of Blanket Stories. Marie Watt’s bronze Blanket Stories: Transportation Object, Generous Ones, Trek graces TAM along Pacific Avenue. Watt explores the humble yet significant role blankets play in people’s lives, in Native American communities, and in the history of the West. 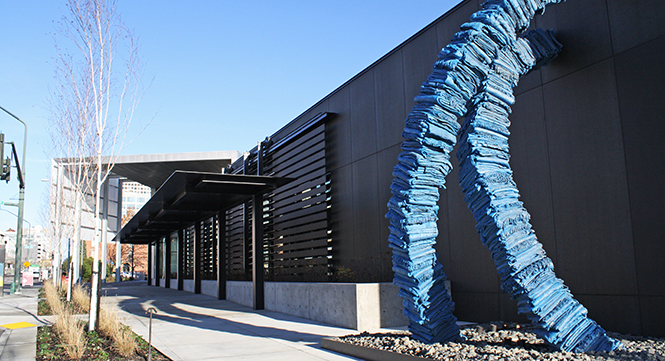 The blue patina of this sculpture references both water and sky, revealing their importance to the Northwest and the West. TAM and Watt collected more than 350 blankets from community members, and even received blankets in the mail from people outside the region. View the App to find your blanket and read the stories behind them all here. Artist Scott Fife at the installation of Explorers. 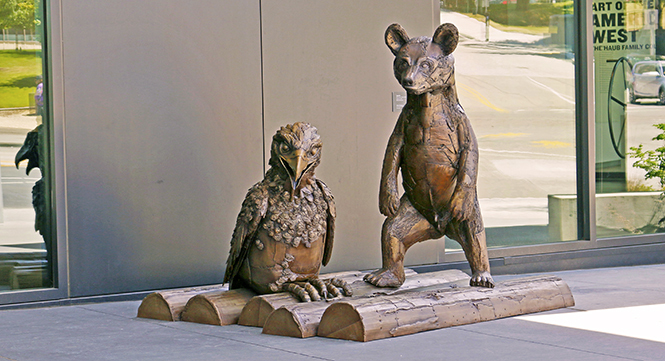 Scott Fife’s Explorers delights visitors with two endearing Northwestern creatures—an eaglet and a bear cub—arriving in the “urban wilderness” via raft. Fife is fascinated by how these species are reintroducing themselves into the new Western landscape. 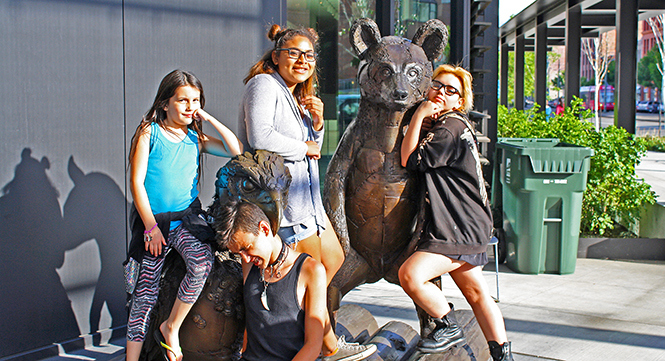 Created in Fife’s iconic cardboard technique, made to resemble chain-saw-carved wood, and cast in bronze, Explorers is located outside the main entrance of TAM. Ginny Ruffner’s first public art project Wings (1990) has been re-installed on the north and east facades of the Rebecca and Jack Benaroya Wing. 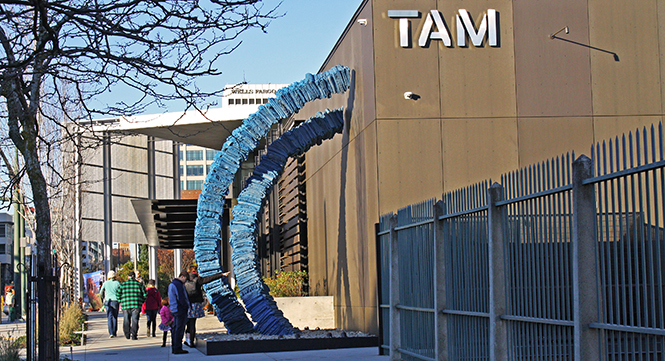 Commissioned for downtown Seattle, TAM received Wings in 1997 as a gift from Seafirst Bank. Wings symbolize everything that is possible with unfettered imagination. Ruffner believes that art and beauty underscore the highest ideals of humanity. Image to come- check back soon!